Are you looking for a way to add interest to your Human Body unit? Do you need more activities for your learning stations? 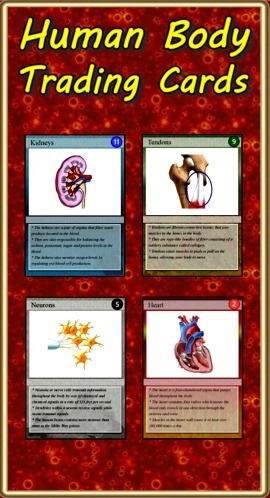 “Human Body Trading Cards” is a set of 54 trading cards highlighting human body systems and organ facts. Print & laminate the cards to create a standard set of playing cards. "Educational Trading Card Games" details 3 original learning games. "Creating Educational Trading Cards" shows teachers and students how to make their own cards. These are super neat! I'm thinking of loading the .jpg files to a drive and printing them at a drugstore. 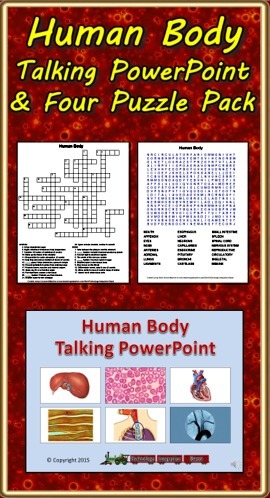 Turn down the lights and turn up the volume for the Human Body Talking PowerPoint! This slideshow highlights 48 human body systems and organ facts. Each slide is narrated so students can progress through the presentation in a computer lab setting. Ideal for introducing topics children can select for further study. Also included are two crossword puzzles and two word searches basic upon facts found in the presentation. Answer sheets are included.